Let attorney David Chester provide you with some simple, easy to understand legal knowledge to protect your financial future. For more information or to obtain a free copy of attorney Chester's other books or DVDs, click the button below, or call his office at (855) 329-7222. Common insurance company tactics that can ruin your claim. Ten secrets you must know NOW to protect yourself and your family. Do you really need a lawyer to settle your case? The answer may surprise you. If you want to hire a lawyer, how to pick the best lawyer for you and "check up" to make sure he or she is doing his or her job. "The information attorney Chester provided and the timely manner in which I received it truly made a difference." "Attorney Chester helped me to understand my rights and get the proper attention for myself." 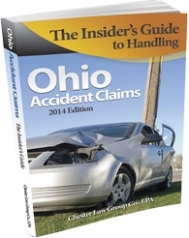 Attorney David M. Chester has been an Ohio personal injury lawyer most of his legal career. After suffering a childhood injury at the hands of a careless driver, Attorney Chester understood the suffering that an injured victim endures. When he decided to become a lawyer, representing injured Ohioans was the obvious choice.